Chapter 10 extract: At the 300 yard par four ninth – shorter from the whites, there is out of bounds to the left but plenty of room to play with on the right; again a solid pitch should get you to the Rowan Over’s green in regulation but there is a sting in the tail. The two-tiered green is very difficult to read and it is not hard to imagine the potential for some evil pin placements. Kenny told the tale of many a ruined card at the eighteenth; at one club championship it so destroyed a possible winning card that the poor victim never played again. It has also been known to reduce a lady playing member to tears and probably grown men if truth be told. 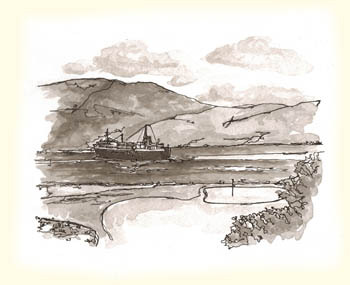 The drawing shows the second green from the high tee with the inevitable Caledonian MacBayne ferry progressing down Loch Broom to the terminal at Ullapool.